Give your team a distinctive look with these caps. The embroidered design on the peak, together with the featured mesh inset, add an imposing accent that will set them apart. 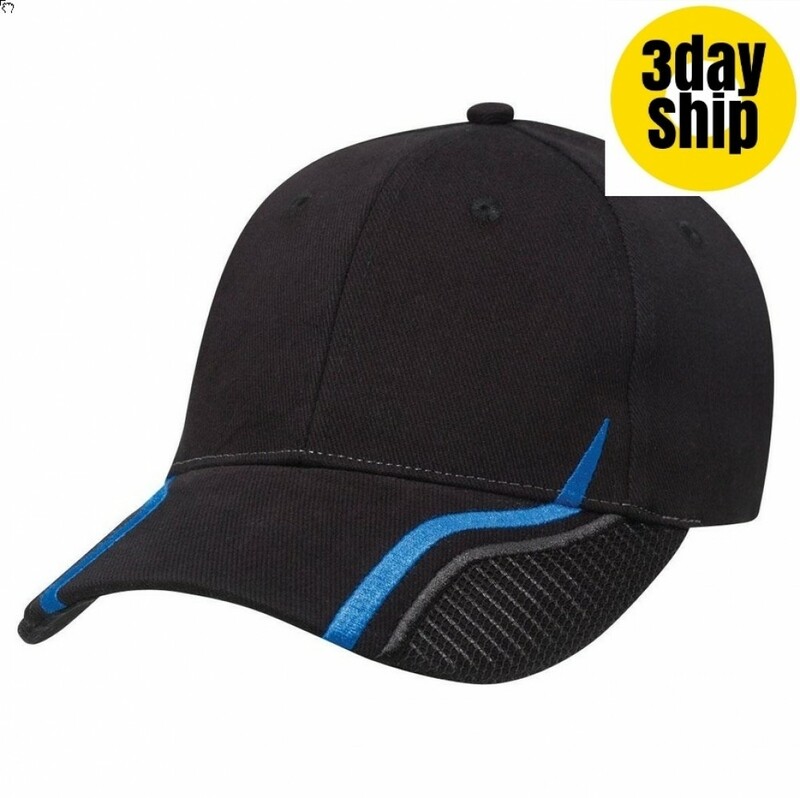 The cap is made from a heavy brushed cotton which offers a smooth and luxurious feeling and is extremely durable. All our caps are made to the highest standards using only the best quality materials. Seams are double stitched for strength and long life. The cap is easy to care for by wiping with a damp cloth and allowing to air dry. This design comes in a two-tone of a black body with a choice of a red or royal decoration. Uplift the look of your sports team, horse riding club, sports club or school uniform by adding these caps branded with your personalised logo or emblem. They also make great give-aways for companies hosting outdoor events, team building exercises or sports events. Talk to our friendly team for branding ideas, we have years of experience. With a fast two-week turnaround and Australia-wide delivery, we can have your caps on your doorstep in time for your next big promotion. We deliver across Australia, to all states and territories -- QLD | NSW | VIC | TAS | SA | WA | ACT | NT. If you have a street address in Australia, we can ship to you. Ask our friendly sales staff for details on rush or bulk orders.